Famed 18th century jurist William Blackstone once said, "It is better that ten guilty persons escape than that one innocent suffer." Theoretically, this is a bedrock principle of American criminal law. A criminal defendant must be found guilty beyond a reasonable doubt, and there are myriad procedural protections and appellate vehicles available to an accused. Because of this, the conviction and imprisonment of an innocent man or woman should be virtually unheard of. But it's not. In practice, the criminal justice system is run by people, and as such is subject to the many fallibilities of the human being. The factors that lead to wrongful convictions and imprisonment run the gamut from intentional, morally reprehensible conduct by those in authority to honest mistakes made by civil servants. At the end of the day, however, each and every instance of the improper conviction of an innocent person is a stain on the justice system. 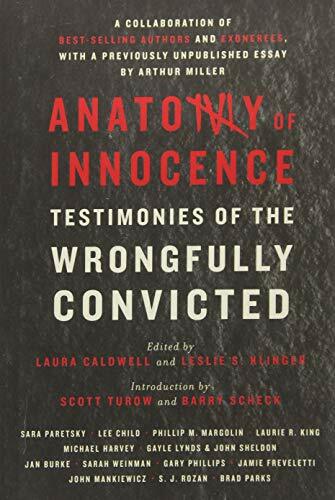 Anatomy of Innocence: Testimonies of the Wrongfully Convicted is a thought-provoking and unsettling journey into the real-world experiences of 14 people who were wrongfully convicted and ultimately exonerated. Their stories are told by high-profile writers of popular fiction, including Lee Child and Sarah Weinman. Each vignette recounts an exoneree's personal story, while highlighting the particular area of the criminal justice system that went wrong. Editors Laura Caldwell, Loyola Law professor and director of Life After Innocence, and Leslie S. Klinger, bestselling editor and practicing lawyer, present a compelling case that something is very wrong with the criminal justice system. Several disturbing accounts of torture at the hands of police are presented most notoriously by the Chicago Police Department's Area Two investigators. False confessions are recounted as is the use of junk science, improperly incentivized informants and bogus eyewitness testimony. Many of the profiled exonerees were simply run over by overzealous police and prosecutors in a hurry to "solve" high-profile crimes. The stories in this collection will make you reconsider things that you thought you knew. For instance, we all believe strongly in the truth of what we see. As Lee Child says, "We all know what we saw." In fact, scientists and courts are slowly coming to grips with how wrong this proposition is. It turns out that eyewitness testimony is not an evidentiary panacea after all. "We all know what happened right in front of our own eyes," writes Child. "Except we don't. What seems to be the best type of evidence is very often the weakest. Getting people to accept that will be a huge task." Another truth that will be hard for the public to accept is that prosecutors are loathe to sit idly by while precious convictions are attacked by innocent persons. Most of the individuals profiled in Anatomy of Innocence faced an all-out war with the government over their attempt to regain their freedom. And every one of them was and is innocent. Despite that fact, they collectively spent many decades imprisoned in overcrowded, roach-infested and violent prisons. Wrongful convictions are an unacceptable scourge. Nearly a century ago, Justice Learned Hand said that, "our procedure has always been haunted by the ghost of the innocent man convicted. It is an unreal dream." That dream, which is a nightmare for the wrongfully convicted, is all too real in modern American criminal jurisprudence. Anatomy of Innocence imparts an important lesson: Innocence may not protect you from the voracious beast that is the criminal justice system; indeed, you may be next.